BUFFALO – The Sabres’ lineup reshuffling Sunday included rookie Mikhail Grigorenko’s first healthy scratch but still left struggling defenseman Tyler Myers’ watching for a second consecutive night. 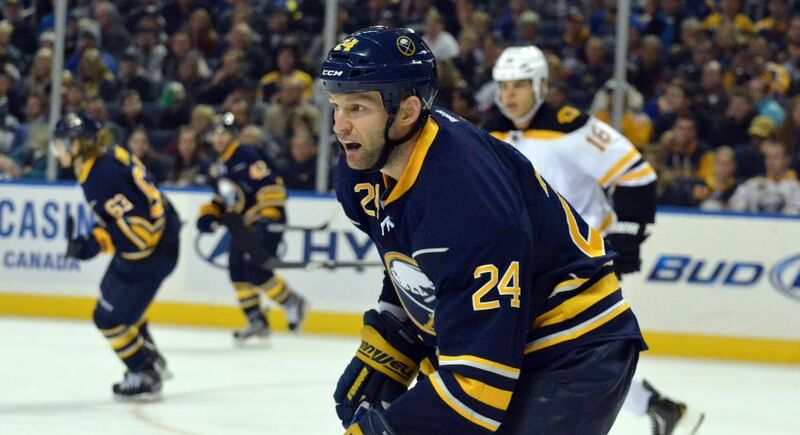 Meanwhile, the Sabres waived forward Matt Ellis to make room for defenseman Robyn Regehr on the 23-man roster prior to their 3-1 loss to the Boston Bruins. Teams have until noon today to claim the 31-year-old Ellis, a high-energy fourth-liner. Sabres coach Lindy Ruff hinted Sunday morning inside the First Niagara Center that the 18-year-old Grigorenko could sit. The Russian’s been receiving minimal ice time recently, skating only 10:34 and 7:13 in his last two outings. Ruff, however, has upped the center’s minutes late in games, awarding him some regular third-period action. Grigorenko, who took the pregame warm-up Sunday, assisted on Alexander Sulzer’s third-period winner in Saturday’s 3-2 triumph over the Islanders in New York. “There’s times he’s going to get good ice time, there’s times where if he’s going well he’ll get more ice time,” Ruff said. “Where you look at early in the game (Saturday), the handling of the puck, he made some choices I’d like to improve. I didn’t like the way some of the players above him were playing, so I put him in a situation where he’d get more. Part of Grigorenko’s development involves sitting occasionally, Ruff said. He cited the handling of young stars Tyler Seguin and Steven Stamkos by Boston and Tampa Bay. The teams brought the teenage sensations along slowly. Cody McCormick replaced Grigorenko after sitting once. The respected Ellis, a veteran of 267 NHL games, could get claimed. He’s cleared in the past, though. Ellis had already sat six times this season. The Sabres plucked Ellis off waivers from Los Angeles during training camp in 2008. He carved out a regular role over the years, playing 72 times in 2009-10 and 60 last year. Ellis could end up in Rochester. He was named Portland’s captain when the Sabres sent him to the AHL for most of 2010-11. The Sabres rewarded Ellis with a two-year contract, including a one-way deal for this season, meaning he would make his full salary in the minors. Meanwhile, it was believed Myers, an NHL-worst minus-9, might play again Sunday. When Ruff scratched the four-year veteran once last season, he immediately recaptured his old form the next game, scoring twice. But Ruff benched Myers, once arguably the league’s best young defenseman, again. “He hasn’t defended well, obviously,” Ruff said. “He’s made some decisions that have been tough decisions on the ice, some gambles that have turned it to goals against. We’ve tried to help him with those decisions. Ruff wants to “rebuild” Myers’ game. “You go back to ground level, you go back to as simple as possible,” Ruff said. Myers, a gaffe machine this season, wants to simplify and enjoy the game. He’s been putting too much pressure on himself. He’s hoping watching a couple of games will help him. Regehr (lower body) missed seven games. He mostly skated with Andrej Sekera.